Woman decides to run the Boston Marathon, never run before by double x-chromosomed individual. Lesson: thinking that women can’t or shouldn’t do something it’s stupid… sooner or later one will prove you wrong. One of the organizers of said marathon is outraged and tries to catch her. Lesson: there’s always going to be stupidity in the world; no matter how better we are there’s always going to be a few idiots out there. The people she’s running with, the proud coach and the boyfriend help her get rid of the idiot. Lesson: No matter how much stupidity a single individual can amass, the collective good will of human kind will prevail. Five years later, women were officially allowed into the marathon. A few decades later, we can’t believe this actually happened because it sounds like a story out of the dark ages. Lesson: the world is changing, it’s changing fast and it’s changing for the better. Move forward with the world or be left behind, don’t stand on the way or you’ll be run over. I doubt any cinemas are going to implement this, because like airlines and banks, they seem to be very bad at making software. Nothing surprising there. A few months ago I was searching for a room in London. There are about 4 big sites to do that, so I posted ads on all of them, and searched on all of them. Only one provided a web application that allowed me to see whether I contacted someone already or whether I marked a flat as not-suitable. It made searching so much easier that soon I was using that and only that site. The ads weren’t better per se, but the software was. I like going to the movies with friends but I dread having to organize it. It’s such a pain because you have to balance the available time of each people, the timetable of the cinema, the shows in which there are still good seats, the fact that the seats might be going unavailable, and handling the money (I tend to pick the cool but expensive theaters). If I was in charge of a cinema, I would make a built-in Doodle. Doodle is an awesome application that helps you organize an event. 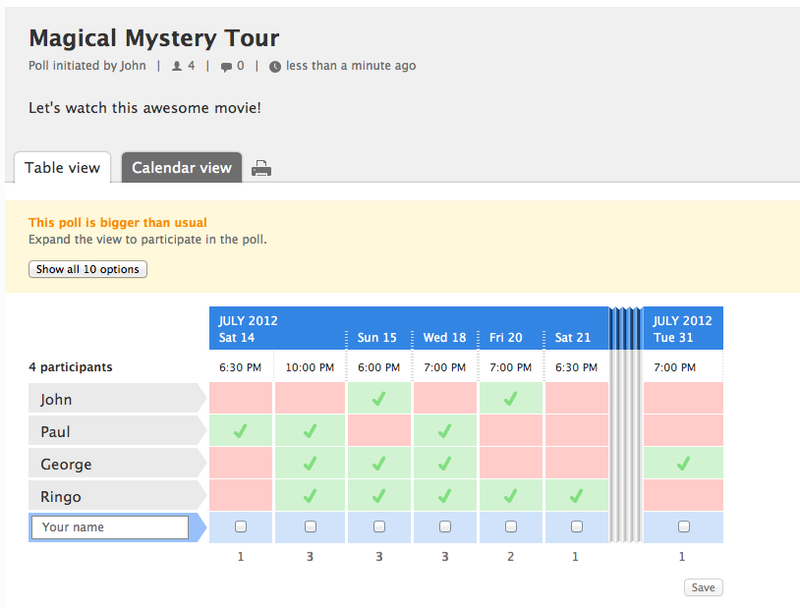 You select all the desirable dates and times, invite the people, and they respond yes or no to each slot. At the end you pick one and go for it. I thought of setting up a Doodle to organize going to see The Dark Knight, but I ended just picking a date and time that was convenient for me and inviting people. It didn’t work. I go to the cinemas website. I pick all the shows I can go to. Set a deadline (maybe, optional). I send the invite to all the people that might want to join me. Notice that I paid for my ticket before picking the date and time. I’m not sure whether that’s a good idea, I would be okay with that but maybe not everybody. What do you think? Look at all the dates and times I and others picked. Buy their ticket or tickets. Pick the dates and times they can. Once everybody is in or I’m done waiting, I pick a day and time and I get all the seats assigned together in one action (even though the action of committing to the movie was individual and asynchronous). For those that didn’t get a ticket or those that changed their mind, they get their money back and/or the option to arrange the same movie, another day, with some of the same group and/or adding other people to it. For the cinema it’s a revenue booster. It makes it easier for people to commit to going to the cinema. And even people than don’t manage to go one day are compeled to go another because they already paid. Build it with nice Facebook and Twitter integration and that’s it, you’ll be the most popular cinema in town.